Last week’s draft saw Essendon steal Irving Mosquito from under the moustaches of Hawthorn. The kid with the “million-dollar smile” was taken at pick #38 by the Bombers and the kid from Hall’s Creek – a life-long Essendon supporter – fulfilled a dream. 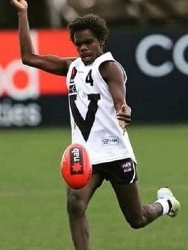 He had to move south to Gippsland in Eastern Victoria to make the dream happen, but he did and now a potentially huge career (already billed as a future Cyril Rioli) begins. But back in trade week, Shane McAdam was snared by Adelaide in a deal that saw Carlton pass him on to the Crows to gain Mitch McGovern. McAdam is also from Hall’s Creek and is now the fourth player from the town in the past three drafts with both Sam Petrevski-Seton (Carlton) and Cedric Cox (Brisbane) being drafted in 2016. Four Halls Creek talents in three years suggests there is still footy gold in them there hills. Just 3400 kilometres away to the east, but almost on the same latitude, is Cairns. It is already documented that current players in Charlie Dixon (Port Adelaide) and Jarrod Harbrow (Gold Coast) are Cairns products as well as recent players such as Courtenay Dempsey, Sam Michael, Peter Yagmoor, Rex Liddy and more. 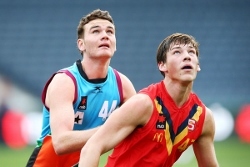 But when Caleb Graham was grabbed at pick #71 by the Gold Coast Suns at the national draft, it created a unique piece of northern history. For three consecutive years, the Gold Coast Suns have gone to the well of the Cairns Saints club and grabbed Jack Bowes (Pick 10, 2016), Jacob Heron (Rookie Draft, 2017) and now Caleb Graham. It is a tribute to the junior club to have had three such talented kids go on to AFL ranks. Whilst Bowes and Heron are pacey midfield types, Graham is a 194cm key position player who may yet help fill the huge gap left by departed captain Tom Lynch. Certainly, as drafting becomes a more exact science, and money is spent to scour the land, players are being found everywhere. But to have an isolated outback town (Hall’s Creek) and a small north Queensland club (Cairns Saints) make such an impact on recent drafts is as wonderful as it is amazing. The two now share a common bond – both are producing talent at an impressive rate in parts of the country not normally associated with big numbers. It proves that if you look hard enough, there is still gold to be found in the most remote hills.